An Infrastructure Hub is the cornerstone of any empire′s expansion into nullsec territory. Once online, it allows the owner to cultivate the system it is placed in by applying one of the upgrades available. These upgrades range from simple improvements to a system′s financial infrastructure, to defensive upgrades giving the system owner significant advantages. To begin upgrading a star system, deploy the Infrastructure Hub close to a planet and activate an Entosis Link on the IHub until your alliance has full control. You must be a member of a valid Capsuleer alliance to deploy and/or take control of an IHub. A maximum of one IHub may be deployed in any star system. IHubs cannot be deployed in systems under non-Capsuleer Sovereignty. 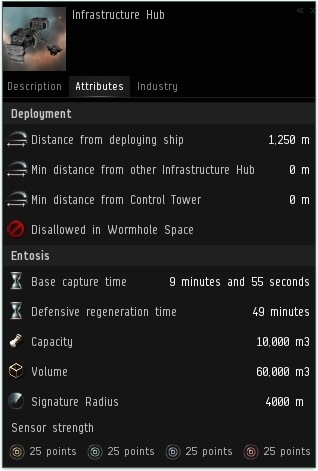 IHubs cannot be deployed in Wormhole space.